Links Microsoft® Project 2010 Standard or Professional with SharePoint® Lists. You choose whether to share the entire project or just a piece. Whether everything goes to one SharePoint task list, multiple lists or multiple sites. Schedule in MS Project as you normally would, connect to SharePoint as you wish you could. The IntelliGantt Add In lets you connect any summary task in MS Project (including the Project Summary Task) with any SharePoint list with rich bi-directional synchronization. Maybe you like folks changing start and finish dates in SharePoint, or perhaps you prefer MS Project own the schedule. With the IntelliGantt Add In’s advanced, field-level data flow control, you’re in control. Start a project by allowing updates to Start and Finish so team members can help schedule. Disallow updates to Start and Finish when executing a project. Best of all, when coupled with our auto-sync feature, you can leave MS Project running and it will enforce its schedule on your shared tasks in SharePoint. Once you’ve created an MS Project to SharePoint task list mapping, you can save it for use later and/or share it on a SharePoint sites for other project managers to use. You can store the mpp file anywhere you’d like and, as long as you have the IntelliGantt Add In, you will be connected to the correct SharePoint site and task lists. If your colleague also needs to work on the plan in MS Project, the IntelliGantt Add In will happily oblige. This enables multiple project managers to work on the same plan and be confident their updates will work together. We’ve update the IntelliGantt Add In to use the very latest VSTO tools from Microsoft and removed as many dependencies as possible to create a quick and easy installation/update experience. For example, just click here! You’ll also find speed improvements that make SharePoint integration so unobtrusive you may even forget it’s there. The out-of-the-box SharePoint task list and project task list are servicable, but if you really want to enhance the project management experience on SharePoint, check out our IntelliGantt Web Part. Special bundling deals are available. 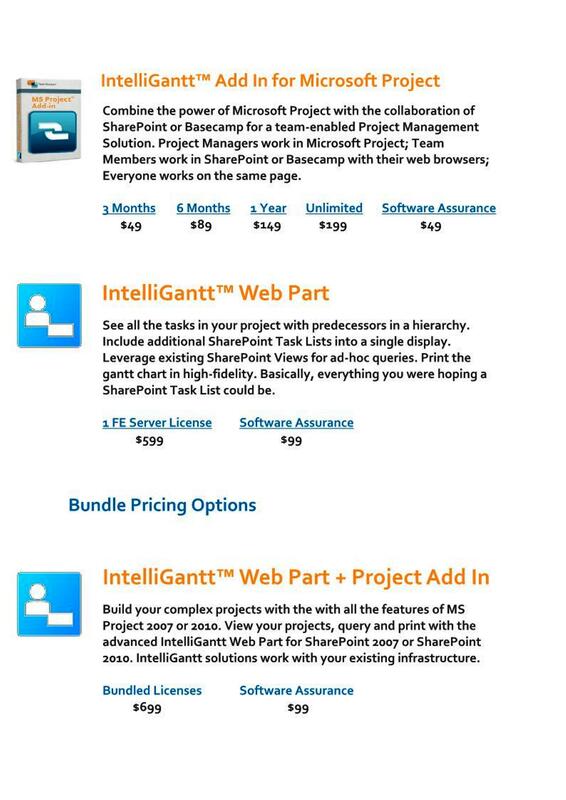 The IntelliGantt Add In for MS Project 2010 lets you share pieces of your project plan to one or more SharePoint sites. This helps you manage a single large project in MS Project and parcel out necessary sub tasks to specific teams in their own SharePoint site. Team members focus on what they need while you still have the big picture. Once you establish the summary in MS Project task that will server as the root, you can import any SharePoint Task List right into your project. The IntelliGantt Add In for MS Project 2010 assumes you are always connected to the network and therefore changes you make in MS Project are immediately sent to SharePoint. IntelliGantt Add In lets you control what data is sent to SharePoint and, just as importantly, what data MS Project will accept from SharePoint. Combined with auto-synchronization, you can be sure MS Project will maintain the schedule and other important fields. The IntelliGantt Add In for MS Project 2010 supports auto-synchronization with your SharePoint Task List. Combined with its Bidirectional Data capabilities, the project manager can decide which fields MS Project owns and which fields can be updated by the team members. The new IntelliGantt Add In for MS Project 2010 makes it very easy to map MS Project resources with SharePoint members. Simply select the two and hit the 'connect' button. The IntelliGantt Add In for MS Project 2010 lets you share pieces of your MS Project plan to multiple SharePoint Task Lists. This makes it easier to work with large projects and share just the pieces you need. The IntelliGantt Add In for MS Project 2010 let's you share an mpp plan to one SharePoint task list and then bundle the same mpp plan into a master project to share with another SharePoint task list. We make aggregation as simple as can be. With the latest SharePoint online as part of Office 365 it can be challenging to connect MS Project 2010 and publish your projects for team members. With new features in the IntelliGantt Web Part makes it as easy as 1, 2... done. If your're project manager maximizing the value of MS Project and all its great features (resource leveling costing, critical path, reporting, etc...) but wish you had a way to easily share tasks with your team, this is for you. If your office uses SharePoint, for example, then your team can actively provide updates their assigned tasks via standard web browsers, and the project manager can see those changes within MS Project. Because it extends the great functionality of MS Project to collaborative platforms, and thus to your team. The IntelliGantt MS Project Add-In lets Project talk to SharePoint with no additional installs-- Period. When we say we help MS Project communicate with SharePoint, we mean it. Over 70 custom fields are now available for you to publish and configure. 30 Text fields, 20 Number fields, 10 Cost fields, 10 Date fields and more. Does everybody need a copy? No, your team members do not need to purchase an IntelliGantt license. Only the person who wishes to share and synchronize an MS Project plan with the team needs it. Although, we think the IntelliGantt MS Project Add-In and a few copies of IntelliGantt make a lot of sense too. What all do I have to install? Just the IntelliGantt MS Project Add-In. That's it. Nothing on the SharePoint server. Nothing on the team members machines. We made this Add-In work for your team right out of the box. What versions of MS Project does it integrate with? MS Project 2003 and 2007. Standard and Professional. Although MS Project Standard by itself doesn't talk to SharePoint, the IntelliGantt Add In certainly does-- as well as to Groove 2007, the Internet Workgroup and the Local Workgroup. How would a PM use this? When the Add-In is installed, an IntelliGantt menu appears on the far right of the menu bar. The project manager doesn't have to change anything about how they work with MS Project. What is added is the ability to 'Share' the project with a group, and then 'Update' the project on demand. MS Project is treated as the master reference. Even if someone thought they changed a due date in SharePoint, the Add-In would set it straight to the project managers view of the schedule. You have the ability to configure what fields team members can update-- and if they have permission to do so. Could I share projects with people outside the company? Absolutely. You could use a hosted SharePoint provider, or Groove 2007 works through firewalls. Or, easiest of all, share to an Internet Workgroup invite anyone who has email (and IntelliGantt installed). Does it have any sort of dashboard? The Add-In comes with a 'Project Organizer' that keeps track of all your shared projects. It has a folder hierarchy to keep track of many projects. A simple double-click opens the project in MS Project. Under the IntelliGantt menu, in the Project flyout is the 'Use Reported Actuals' menu pick that updates MS Project's Actual Start and Actual Finish values with the Actual Start and Actual Due Date values from your SharePoint task list. Because the change can be dramatic, this lets you make a backup first or establish a separate baseline. What's a cool feature you haven't mentioned yet? The IntelliGantt Add-In for MS Project also gives you the ability to connect MS Project to existing SharePoint task lists. Furthermore, you can set it such that tasks created in SharePoint will show up in MS Project. If you want a simple way to share MS Project tasks with you team, there is nothing easier or more economical. What is a Local Workgroup? Glad you asked. The following FAQ are dedicated to this question. Basically a File Server you already have running in house. If you're worried at all about sending data across the internet, or simply don't need to, then you should look in to the Local Workgroup. It's no more complicated than sharing a file to a server.It's as fast as your local network, as secure as your intranet, as failsafe as your current backup procedures and as distributed as your WAN. As long as everyone in your workgroup can access the file server, then everyone can participate in the project. You just tell IntelliGantt where to put it and it figures out the rest. Because it works with your infrastructure right out of the box. Everyone has a file server or three in house. What has been missing is an application that makes use of your current resources- until now. So it's like storing a file on a server? Yes. IntelliGantt manages keeping the files, and therefore the project view, update to date for everyone. It also keeps track of where things are located. This makes it very easy for people to join projects shared to a Local Workroup all they need to do us double-click on the invitation and they're in. When using the Local Workgroup, IntelliGantt only transmits and receives data from the file server you designate. Basically, it's as safe and secure and your file server. Do I have to checkout and check-in my changes? ABSOLUTELY NOT. Unlike most solutions, TeamDirection merges everyone's changes together into one view of the project. All you need to do is press the update button when you want to send and receive changes. Is there a master project somewhere? Everyone has a copy of the project on their local computer. This lets you work offline-- even disconnected from the intranet. When the time comes, you 'update' the project on the internet server and merge project changes into your local copy. What if the project is removed from the Local Workgroup? Since everyone has their own copy of the project, the group just needs to decide who will republish it to the server-- most likely the project manager. No-one needs to rejoin or do anything extraordinary. Because everyone has a local copy of the project, everyone essentially has a backup of the project. What if my file server goes down? You can still continue working on your project and simply update when file server is running again. In the worst case scenario (having to buy a new server), you can simply republish your project to the new server and invite your team members again- no project data will be lost. How big are these project files? We've found a 'simple' 1000 task project turns into about 75K or so of file data. Do all IntelliGantt products have Local Workspace capability? Yes. Both IntelliGantt and IntelliGantt Plus can publish to, subscribe to and synchronize with a Local Workspace. The Microsoft Project Add In can publish to and synchronize with a Local Workgroup, but not subscribe. Hey, are you guys patenting this merge technology? Intuitive Collaboration for Online Teams. Hierarchies and Gantt Charts provide a rich amount of information in a small space-- simple task groupings, task to task dependencies and basic rollup information for example. TeamDirection's IntelliGantt products enhance the SharePoint and Basecamp systems you use today with more complete, and often times simpler, ways to view and work with your projects. Our goal is to make it easy to sift through your project data as you move back and forth between the big picture and the day-to-day. Selecting a view to use from a dropdown box. Changing the Gantt zoom scale with a slider. Providing rich in-place editing. Giving all 'clickable' images mouse feedback. Highlighting which task files will attach to during a drag and drop operation. Making each file attachment viewable in a web browser. We've applied over seven years of customer feedback into providing the best, even complex, features in as intuitive a way as you'll ever find in a project management tool. Finally! 'What you see is what you get' is now available for both Windows and Mac platforms. By default IntelliGantt will print the entire range of the project, but you can customize the printing by specifying your own range. You can then see a preview of each individual page as its sent off to the printer. Install the IntelliGantt Web Part as a WSP solution for SharePoint 2007or for SharePoint 2010 and use a server license. Install the IntelliGantt.xap file in a Shared Documents list for hosted SharePoint solutions (2007 or 2010) and use a server license. Install the IntelliGantt Web Part for SharePoint on your desktop, talk to any SharePoint 2007 or 2010 server and use a client license. Install the IntelliGantt Web Part for Basecamp on your desktop, talk to any Basecamp setup and use a client license. IntelliGantt will periodically query SharePoint or Basecamp for changes to tasks. When a change is found, it is highlghted within the task list by becoming bold, much like a new email in your inbox. Clicking on the cell marks it as 'read' and reverts it back to its normal text. Or, if you have an active view like 'My Tasks', tasks that are marked completed will be removed on refresh, but new tasks assigned to you will appear-- also like new email in your inbox. If you'd like the IntelliGantt Web Part in your language, let us know! The IntelliGantt Web Part works with SharePoint 2007 and 2010 simply by being placed on a page. After installation, select 'IntelliGantt' from the 'Project Management' category. Once placed, the web part will automatically find and display a full hierarchy of your SharePoint tasks. An Unlimited license is the traditional software license-- buy it and own it. Each Unlimited license includes 1 support case good for 1 year from date of purchase. Additional support and software assurance are not included and may be purchased separately. Since SharePoint Front-End servers are used to handle an increasing amount of users, the IntelliGantt Web Part is licensed per SharePoint Front-End Server instance. If you have a single SharePoint server, then a single license of the IntelliGantt Web Part is required. Similarly for hosted solutions, each hosted domain will require an IntelliGantt Web Part license (e.g. wss.teamdirection.com is our hosted domain). Finally, for SharePoint farm installations, each front-end server instance will require a license. TeamDirection's Software Assurance (SA) helps your organization get the most from IntelliGantt software. Unlimited license SA includes feature requests, license reassignments, software updates as they become available and 1 support case, good for one year from date of purchase. In addition, TeamDirection will provide web-based training for volume SA purchases greater than 5.